Revising curriculum has been nothing like pulling teeth for the College of Dentistry. The changes have been broken into three parts, explained Dr. Gerry Uswak, dean of the college, with the first phase—establishing a more robust table clinic program focused on student research— already complete. "About three years ago we decided to redo our curriculum," explained Uswak. "We always had a table clinic course as part of the required curriculum, but it was only a year long. It's hard to learn the basics of research and do significant research in that amount of time." So the table clinic program was extended to just over two years in length—starting in term one of first year and ending in term one of third year— providing a larger window to do substantial, more meaningful research, explained Uswak. The college also adapted some research modules used in the College of Medicine to create a more formal framework for students to learn about research methodology. "We have a responsibility to create professionals and contribute to research at the university," he said. "Through interprofessional, experiential learning, the table clinic does that." The results speak for them­selves. 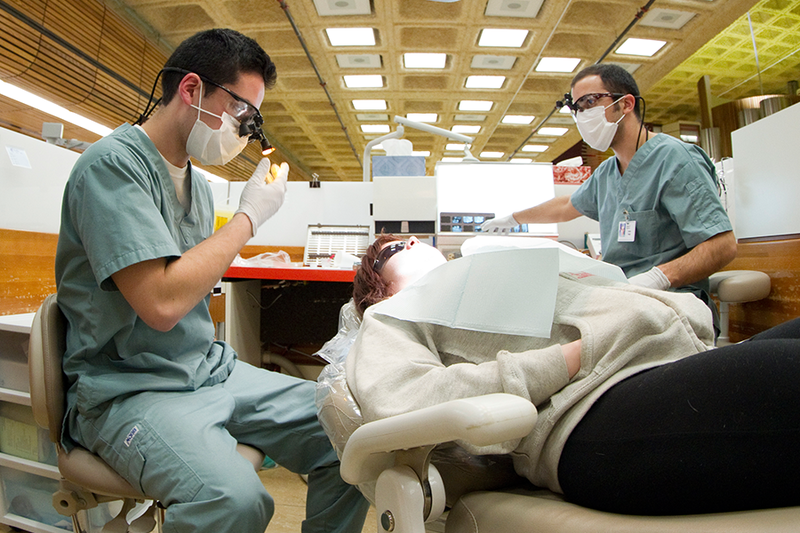 Two years in a row now, U of S dental students have won top place at the national compe­tition held by the Canadian Dental Association, beating out the best research projects from the nine other dental schools in Canada. "This supports what we thought. If we enhanced the research methodology it would result in a better project, and if we increased the time the quality would go up. Now we have two national champions. Next we hope to find more funding for student research projects," said Uswak, adding that the U of S table clinic program is already one of the strongest in Canada. The second phase of the revamped curriculum, perhaps the biggest of all of them, is moving from a four-year program to a three-plus-one program. "This means compressing the traditional four-year dentistry program into three years," Uswak said. "At the end of three years our students will then spend one more year in a community-based practicum, internship or apprenticeship." Uswak said that everyone in the college believes they can compress everything taught in the four years—didactic, preclinical and clinical—in three years, thereby allowing students to gain an extra year of practice in clinical settings in the fourth and final year. "Most of our graduates will end up in private practices, so this will further develop those clinical skills and how to run a clinic. They will have a year of that experience before gradu­ating." The plus-one year, Uswak continued, will take place in communities throughout Saskatchewan, which may entice some graduates to stay in the province once they experience life in rural areas. A change of this size, however, will require the college to move to a trimester system that will have students studying year round, a worthwhile tradeoff for Uswak. "In this curriculum, our students will have more clinical and practical experience with patients than any other program in North America." Uswak, who hopes to see the new curriculum in place for the 2018-19 class, said the college is "taking a 10,000-ft. view right now, looking at timelines, approval processes and building new curriculum. When we are done, this could be a model for other dental schools." The final change to the college curriculum is the intro­duction of a graduate program in dental public health, which would be the first graduate offering from the college. "We can move quickly on this initiative and hire up to four more faculty to create the core in this specialty," explained Uswak, adding that this could be offered in about a year's time. All of these changes, he continued, are in line with the college's goals. "We are creating well-rounded dental professionals who appreciate research, help patients and can be academics who become the next dental professors."